This plant can only be bought in nurseries, since it is a native plant from India, where it has been used for a long time now, to treat many illnesses and conditions and a wide variety of inflammation and joint related problems. It seems to give the same level of relief from pain and inflammation as over the counter remedies and prescription drugs, but without the side effects those medications can bring.upsetting the stomach, like the previous ones can do. 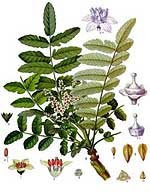 Boswellia has also been used to treat chronic back pain, for relief to many osteoarthritis and rheumatoid arthritis pain, and sometimes intestinal problems as well. See also Frankincense Supplement for additional information. Gum resin from the bark of the Boswellia tree found in India. Capsule or pill; typically 300 mg to 400 mg three times per day. Look for products with 60-percent boswellic acids, the active ingredient. Reduces inflammation and treats RA, OA and bursitis symptoms. Indian frankincense may treat symptoms of ulcerative colitis and Crohn's disease. May have anti-inflammatory and analgesic properties but evidence is limited and effects are inconsistent. In a 2004 study, Indian frankin­cense was tested as a treatment for knee OA. Researchers recruited 30 people with knee OA and gave half the group a daily supplement containing 333 mg of Indian frankincense; others got placebo. People who took Indian frankincense reported less knee pain, better mobility and an ability to walk longer distances than those taking placebo. Boswellia is available in pills, capsules, tablets, and a number of topical creams that can be applied directly to the affected area. Along the bank of the river, on this side and that, will grow all kinds of trees used for food; their leaves will not wither, and their fruit will not fail. They will bear fruit every month, because their water flows from the sanctuary. Their fruit will be for food, and their leaves for medicine."